John Bernard Feit enters the 92nd state District Court before the start of closing arguments in his trial for the 1960 murder of Irene Garza Thursday, Dec. 7, 2017, at the Hidalgo County Courthouse in Edinburg. The cold case that has captivated the Rio Grande Valley for more than 50 years is now in the hands of a jury. The jury has been moved out of the courtroom to begin deliberations. Jurors are instructed that “intent to kill” is an essential element of murder. If jurors have reasonable doubt regarding this element, they are to consider aggravated assault. Defense says there is no evidence that Feit had intent to kill or was involved in Garza’s disappearance. The defense passes to the state for its rebuttal. The prosecution begins its closing arguments with three points it made during the the trial — betrayal, murder and a cover-up. “Irene Garza was so distorted, so maimed that they had to have a priest identify her,” the prosecution said during its closing arguments. The state only needed five days to make its case against Feit. Both the state and defense rested after testimony from only a handful of witnesses Wednesday. The state called Hidalgo County’s forensic pathologist, Norma Jean Farley, who gave her opinion based on files and medical records on Garza’s autopsy provided by the state. The forensic pathologist was not on the stand long when she testified that Garza was killed by asphyxiation, most likely from being suffocated. The defense did not cross-examine Farley. 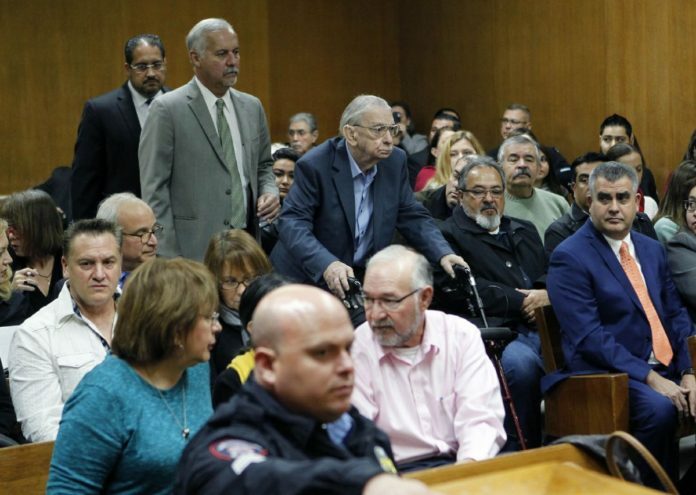 The defense, after the the state rested its case, called back to the stand the Texas Ranger who was part of the cold case unit that re-opened the Garza case in 2002. They also called octogenarian Faustino Rodriguez, a friend of Garza’s from their high school days. Rodriguez testified he saw her at Sacred Heart in line for confession the Saturday night she went missing. His testimony was the defense’s attempt to establish that Garza was seen around 8:30 pm and 9 p.m., a point that contradicted the state’s contention that she was last seen around 7 p.m.
After Feit opted against testifying, citing common sense over his own vanity, the defense rested, setting up today’s closing arguments.